Like me everyone like to have an iPhone or iPad. Having Apple gadgets is a different taste. But with this there are many drawback also. Most important is of its storage and file sharing. It have limited storage space and file sharing is only with iCloud, which is pretty hurdles for average users. 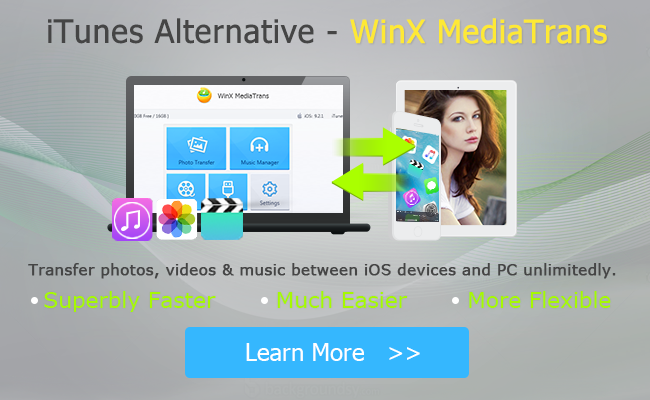 Especially for this, WinX MediaTrans is the best solution to manage iPhone media files. This small and simple application solves all your problems like a magic. Transferring all your files, photos, videos and other documents into your computer is very easy with WinX MediaTrans. The transmission of data from iPhone to PC is really very fast as it supports Intel QSV and Nvidia NVENC hardware acceleration. Users can transfer videos and photos, at the same time it also convert videos from AVI, FLV files etc to the compatible format that were able to play on iOS devices. Export & import is very fast as it can transfer 100s of 4K resolution photos only in 8 seconds. You can also manage your playlist by creating, editing and deleting your music files right from your PC without any iOS software. With WinX MediaTrans you can also create ringtone, manage voice memos and it auto detect your video to convert into iOS supported formats. Another great feature of WinX MediaTrans that makes it unique from others is, it has a decryption capability means it can decrypt or decode the movies that were downloaded directly from iTunes. Snyc of other file like music, audios is also possible with it. Compression is another great feature where users can compress there videos size by 50 percent without losing its quality that saves much of your storage space. The main thing that I like in WinX MediaTrans is it converts your iPhone into a secret and secure flash drive with a capability of storing any type of files including application, documents, PDF, ZIP files etc. As an iPhone manager, WinX MediaTrans is a best application with the simple and powerful features. The application is available for both windows and Mac platform that too for free. You can enhance its features by getting a premium license directly from its website. How to Transfer iTunes Purchased Movie to PC with WinX MediaTrans? You all know that videos or movies that we watched from iTunes store is not transferred and can't save on storage. Hence for this issue WinX MediaTrans is a great solution. The software's unique features allow you to save and transfer videos, movies and music to other devices (non iOS device) too. WinX MediaTrans come with the DRM decode feature lets you to perform these task easily. With the following easy steps you can transfer all your iTunes purchased videos to PC. Get the Free Licenses Code to Transfer Your iPhone Files Now >> Download and install WinX MediaTrans on your Windows PC. Connect your iOS device with your PC via USB cable. Note: Application will automatically detect your device and after device detection do check (tick) 'prevent iPhone, iPad from syncing automatically' in iTunes. This is to be done to prevent any data loss. 1. Now from the main menu section, select any of your desired option. For example if you like to save videos or movies, select Video menu. For music click on Music manager on the home interface. 2. Now after selecting Video menu, a pop-up window appears showing the section of your videos in left panel. Select Movie tab and select any video that is DRM encrypted. As you select an encrypted video files you get another option, a green decode button. Click on the green decode button to decrypt the DRM protection. 3. After successfully decryption, just select "Export" option to transfer the decrypted movie or video to PC. That's it you done with the simple steps. Follow same procedure for music and book too. Now you can easily transfer any movie or video file to other devices too.